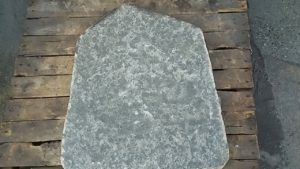 1 1/4″ Shaped Basalt Stepstone – Creative Bricks 'n Blocks Ltd.
Basalt Step Stone is a 1 1/4″ thick natural rock with a flamed top and honed back; shaped and cut for beauty and functionality. 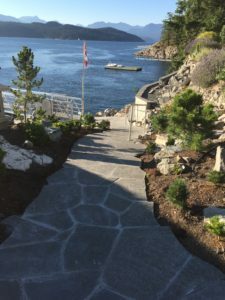 The even thickness and regular surface makes this stone perfect for walkways and patios, where a level safe surface is needed. 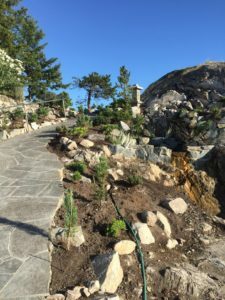 It can also be used as a simple step stone pathway though a garden. 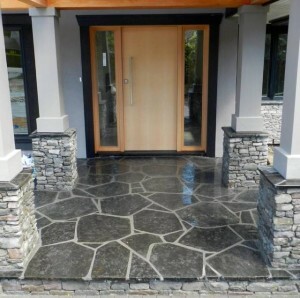 The flamed surface adds textural interest but is also practical as it increases skid resistance of the surface.